A powerful and illuminating book. “Failure to appreciate luck’s importance has made successful people more reluctant to pay the taxes required to support the investments necessary to maintain a good environment." 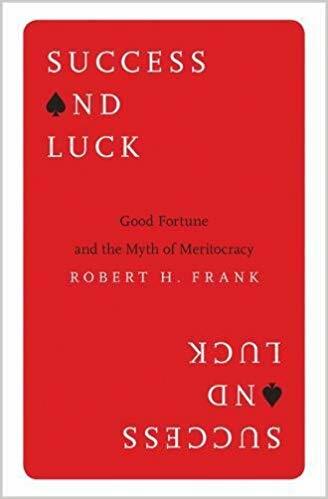 Success and Luck: Good Fortune and the Myth of Meritocracy by Robert Frank is a quick and illuminating read about the fundamental role of luck in success, how ignoring that simple truth contributes to wealth inequality, and a straightforward tax-based solution to help mitigate it. The problem is simple: people who succeed, at anything really, attribute their success solely to hard work and perseverance, negating the ever-present role of luck. And those who don’t succeed are often seen as simply not trying hard enough, or lacking the skill and expertise to succeed, as if somehow deserving of their poor fortune, rather than considering their lack of good fortune. This is belief is inaccurate of course. Luck — from the country you are born into, the color of your skin, the wealth of your parents, the food your mother ate before you were born, the circle of influence wealth gives you — is completely outside our control, but each element contributes to a cumulative propelling effect that, in addition to effort and tenacity, lead to more opportunities and better potential outcomes. The problem of course is without the myriad forms of luck that lead to enrollment in an ivy league school or a job on Wall Street, all the hard work and tenacity in the world still can’t overcome bad or even neutral luck. Admitting to this, which seems pretty straightforward to me, drives some people to distraction, as if it’s an attack on the American dream itself. And NOT owning up to this has dramatic effects on society. Being born lucky (and that can take any number of forms — say, white, straight, into a wealthy family in an affluent neighborhood) — and you get to swim with the economic currents. If you’re born unlucky, and start taking away any of those attributes, you have to swim against the currents. Effort, tenacity and personal responsibility still count, it just takes two, three or four times as much to make it half the distance. The author uses some basic studies from cognitive science — all the biases we carry around with us to justify being the heroes of our own stories — to bring this to light. And he offers a simple tax change to start mitigating against the inequality and lack of opportunity that keep so many swimming against the current: a progressive consumption tax rather than an individual income tax to generate enough revenue to fund a society that can help offset bad luck and create more opportunity. His proposed tax plan works something like this: people pay taxes on the difference between what they earn and what they save, the money spent on consumption. It’s progressive, so money spent on the basics, say, food and rent, is taxed at a lower rate than money spent on a condo on Park Avenue or a high-end sports car. The tax, in essence, helps re-direct money spent on lavish items into the federal coffers to spend on infrastructure and social investments and, since we’re all in the same boat, it doesn’t feel like the wealthy are being singled out to pay a greater share. It seems like a pretty elegant solution — and one that will progress exactly zero inches under the current administration and in a society that seems determined to redirect the fruits of the economy to the lucky few at the top — deserving of it’s own book. Still, it’s great to see an author providing an actual, well-thought out solution to wealth inequality and shining a light on the dark side of a society in which so many struggle to get by while a lucky few, with wealth and influence passed from generation to generation, shape policies that prevent others from having the opportunity, with a little luck, to climb the ladder as well.